Roll out pie dough on a lightly floured surface. Place dough in tart pan, and pierce bottom with fork. Arrange the apple slices in the tart pan, in a concentric circles. Whisk together the melted butter, brown sugar, cranberry sauce and orange marmalade in a small bowl and drizzle over the entire tart. Return tart to the refrigerator for 15 minutes. Bake for approximately 1 hour, or until crust is golden brown and apples are tender when pierced with a toothpick. 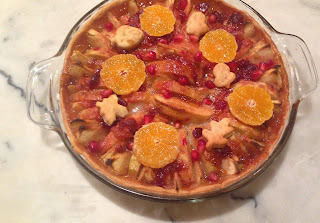 While the tart is still warm, top with pomegranate seeds and clementine slices.